Crusaders battled back from an early blow to beat Ballymena United and extend the club’s unbeaten run to 15 consecutive fixtures. A 13th goal of the season proved lucky for Gavin Whyte across the hard-earned win against spirited United. Ballymena enjoyed a strong start, with Johnny McMurray at the heart of everything positive by the visitors. United held the upper hand across the initial stages and an ambitious effort from wide on the right by the livewire McMurray cleared the crossbar. McMurray and Matthew Shevlin then linked up along the right but Conor McCloskey’s backheel flick lacked the power to test Sean O’Neill. Crusaders hit back when Whyte picked out Jordan Owens but the striker’s downward header was blocked and cleared by Kofi Balmer. McMurray’s encouraging start was capped by individual quality on 18 minutes to help break the deadlock. A Steven McCullough ball was picked up by McMurray and he created space with a clever spin before feeding a low pass between the Crusaders backline from left to right into the path of Shevlin. The teenager displayed composure to cap the slick approach play with a fitting finish. Crusaders regrouped and gained a reward on 37 minutes when Paul Heatley’s corner-kick evaded the advancing Ross Glendinning and Colin Coates was on hand to head home from a few yards out. Determination by McMurray early in the second half kept alive a Ballymena attack, with Cathair Friel racing in but his shot on the run was blocked and deflected wide. But Crusaders moved in front around the hour mark as a clipped pass from Whyte was collected by Heatley and Kyle Owens’ challenge led to Tim Marshall awarding a penalty. Whyte proved calm to convert. Shevlin was then on hand to head Howard Beverland’s looping header off the line. The United goalscorer came close to his second on 88 minutes off a slick Kevin Braniff pass but Sean O’Neill’s out-stretched boot diverted the attempt - and secured success for Crusaders. CRUSADERS: O’Neill, Burns, McChrystal, Beverland, Coates, Cushley (Ward, 86), Forsythe, Snoddy, Heatley (Caddell, 67), Whyte, Owens. Subs (not used): Dougherty, Nimick, Kerr. 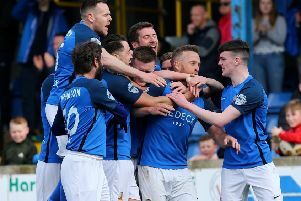 BALLYMENA UNITED: Glendinning, Kane, Owens, Thompson, Friel, McCloskey (Braniff, 78), Shevlin, Balmer, Ervin, McCullough, McMurray. Subs (not used): McAlorum, Brennan, McCaffrey, McKinney.